This French film with subtitles in English has a simple premise. 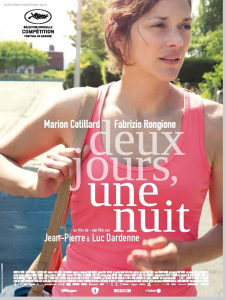 It is done very well and the lead actress, Marion Cotillard who plays Sandra is magnificent. The film held our interest and our emotions for 1 hour and 36 minutes. Sandra is a Belgian housewife who works in a factory that makes solar panels. There is a divisive labor issue in her workplace.. Apparently, after Sandra was out of work for a brief time (suggestion is that it was for depression), her boss decided that the workgroup could vote whether to have her come back, but if she does come back, they could not afford to give everyone the thousand euro bonus. Due to a question raised about the voting procedure, there will be a redo vote on Monday but everyone knows that if they vote for Sandra to come back to work, they all will lose the projected thousand euro bonus. With the urging of her husband (Fabrizio Rongione) who works as a waiter in a fast-food restaurant, Sandra tries to visit the 15 or 16 co-workers at their homes over the weekend to ask them to vote to keep her on and forego the bonus. The interchange that she has with her co-workers as she visits most of them gives us an insight into the struggles of these working people, as well as their moral character. They all desperately need the bonus but just about half of them seemed to be willing to vote for Sandra to return to work.